Clinton told crowd she cheered when Prime Minister Justin Trudeau appointed the country’s first gender-balanced cabinet. 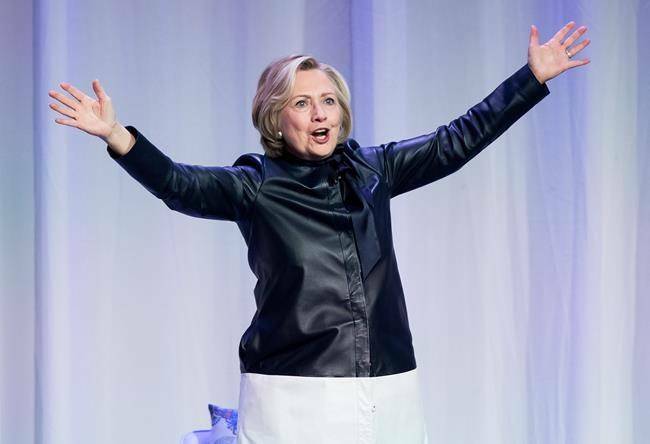 Dec. 13, 2017 3:30 p.m.
Hillary Clinton says she feels ”a tiny bit less” concerned about the United States following the Democratic party’s surprise win in Alabama’s senate race on Monday. The former presidential candidate is calling the electoral upset a turning point for Americans in pushing for accountability from President Donald Trump, who backed the unsuccessful Republican candidate. Clinton made the comments while in Vancouver promoting her new book. She expressed concern about Trump’s impulsive social media habits and pledged to remain part of the debate about the future of the U.S.
Clinton also told a crowd of more than 5,000 people that she cheered when Prime Minister Justin Trudeau appointed the country’s first gender-balanced cabinet. Clinton’s memoir, “What Happened,” explores her experience running as the Democrat nominee in the 2016 presidential race and the aftermath of her loss.